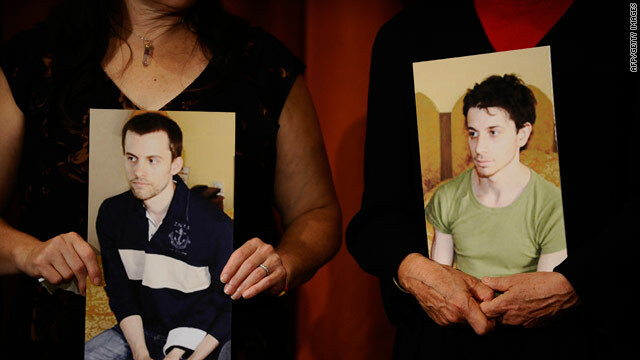 The mothers of Shane Bauer, shown left, and Josh Fattal hold pictures of the two hikers being held in Iran. (CNN) -- Two American hikers held by Iran for more than a year will stand trial before an Iranian court next month, the country's official news agency reported Saturday. The Americans will appear before Revolution Court on November 6, the Islamic Republic News Agency said, citing the hikers' lawyer, Massoud Shafee. U.S. Secretary of State Hillary Clinton and the mother of one of the hikers had said Tuesday that the Americans' lawyer had recently reported that the trial would begin November 6. Hikers Josh Fattal, Shane Bauer and Sarah Shourd were arrested after Iran says they crossed into the country in July 2009. They had been near the unmarked border separating Iran from Iraq's Kurdistan region. The hikers described themselves as tourists. Tehran contends they are spies. Shourd was released on humanitarian grounds in September, but Bauer and Fattal remain in Tehran's Evin Prison on accusations of spying and entering the country illegally. A classified U.S. field report that was among 400,000 documents released Friday by the whistle-blower website WikiLeaks appears to lend credence to claims that Iran crossed the Iraqi border to arrest the Americans. The report lists a number of military grids where the Americans were believed to have been hiking or had been detained -- all on the Iraqi side of the border, according to The New York Times, which reviewed the document with aid from an American government official. "This has been suggested publicly before," State Department spokesman P.J. Crowley told CNN on Friday. "The simple answer is, we don't know. All we know is that two hikers remain in Iranian custody and should be released today. They have done nothing wrong." The July 12 edition of The Nation magazine cited two witnesses who said they saw members of Iran's national police force in July 2009 cross the border into northern Iraq to apprehend Shane Bauer, Sarah Shourd and Josh Fattal. The military document, dated July 31, 2009, the date the hikers were detained, has been heavily redacted. It includes references to Kirkuk and Baghdad, cities in Iraq. A fourth hiker who became ill and did not go on the trip "reported that a kidnapped female called him saying that they were being surrounded by armed men," according to the report. A drone aircraft was sent to look for the missing Americans, and two F-16s jet fighters were alerted, the Times says of the document. Shafee, the Americans' lawyer, said that he expected the trial to be closed to the press, IRNA reported Saturday. The November 6 court session will be headed by Judge Salawati, IRNA said. Shafee said that Iranian law stipulated that "all courts' sessions should be public except for some exceptional cases, and considering the specialty of this case, I believe that this session will be closed." Cindy Hickey, Bauer's mother, was told by her son's attorney in Iran about the trial date some three weeks ago, she told CNN on Tuesday. She said that she hasn't spoken to her son since May and currently has no plans to attend the trial. "We hope things move forward. Of course we know Shane and Josh are innocent and hope they are released before the trial," she said. The United States, which has not had diplomatic relations with Iran since 1979, has relied on Switzerland to appeal directly for the hikers' release. "We continue to express our hope that the Iranian authorities will exercise the humanitarian option of releasing these two young men," Clinton said Tuesday. "We do not believe there is any basis whatsoever for them to be put on trial."